This Action Kit makes it easy to help build NMBI public support. There are social media auto-share links, materials and tips for talking with your local MP or election candidates, and hardcopy petition sheets for collecting signatures. Just go ahead in whatever way suits you! Or, submit the I Can Help form at the bottom of this page and we’ll email campaign materials to you. There’s something even the busiest people can do – if that is you, we can email you the latest auto-share Facebook/Twitter links just when there is something we’d particularly like you to share. Click the image above or click here to share a Facebook post inviting people to sign the NSW NMBI petition. Click here to share a Tweet with the above image inviting people to sign the NSW NMBI petition. Click here to share the above infographic on Facebook. Click here to share on Twitter. 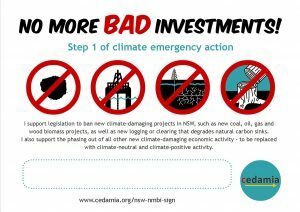 Take a look at the NSW NMBI Talking Points to familiarise yourself with the issues involved with banning new climate-damaging projects in NSW. A NMBI Q&A doc can be downloaded here for your own reference. Or, you may wish to print a copy to take along when you speak with your local MP or election candidates or for an info stall at an event. 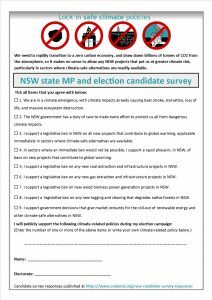 Download the above sheet as a pdf file, print, then ask your local MP or election candidate to sign. Take a photo (landscape orientation preferred) of them holding up the signed sheet, and email it to us for inclusion on this website and social media. See the MPs and election candidates who have signed so far at https://www.cedamia.org/nsw-nmbi-supporters/. Download the above sheet as a pdf file, print, and take it along when you talk with your local MP or election candidate. Once the sheet is filled in, please scan the sheet and email it to us for processing. Note: MPs and candidates can also take the survey online, but they will need an ID code from us to do that. Email us with your local election candidate name and email address if you want us to send them the survey link and ID code. See the survey results received so far at https://www.cedamia.org/nsw-candidate-survey-responses/. 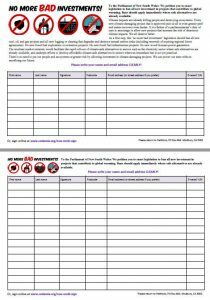 Download the above sheets as a pdf file, print, and ask people to sign at stalls, markets, public events, or anywhere really!